Favorite food: Anything I am not allowed to eat. Favorite toy: Soft ball and stuff animal. Favorite activity: Chewing on my dad's hands when I can. Special talents: My dad says I am the best westie puppy in the world. Most embarrassing moment: Fell down a rabbit hole. My dad had to come and actually pull me out. STUPID RABBITS. Most trouble I ever got into: I am a puppy, I get into trouble every day. 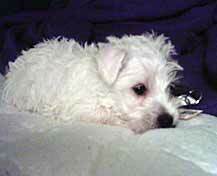 My favorite friends: Cyurs westie.... my brother. Biggest adventure: Not sure, still exploring the area outside my back yard and house.